The CipherLab RS30 Touch mobile computer is a rugged smartphone with industrial scanning engine. Its solid protection ensures worry-free applications in the field. The big touch screen along with Android operating system demonstrates the user interface as familiar as any personal smartphone. 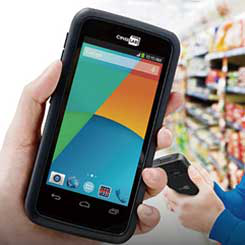 Equipped with versatile reader options, near field communication and other functions, the RS30 mobile computer offers a rugged and intelligent solution to meet mobile workers’ needs.